Bellwether stock Nvidia was torched on Monday in the US after announcing a downgrade due to a slowdown in China; The US government shutdown comes to an end... for now; hundreds missing as another tailings dam collapses in Brazil; and US Justice Department files charges against Huawei in escalation of US-China trade war. Here's what's happening in markets today. Chipmaker Nvidia is often seen as a leading indicator for the state of the consumer economy, and signs aren't looking good following a downgrade on Monday in the US. After a record 35 day shutdown pulled an estimated $3 billion from the US economy, workers are now back to work and getting paid. However, it could happen all over again in just a couple of weeks if a new bill isn't passed. Trump stated this was a 50-50 chance. Just over three years after the Samarco disaster, another tailing dam in Minas Gerais in Brazil has collapsed, leaving 300 mising. The mine is operated by Vale, who was also partially responsible for the Samarco collapse in 2015. The US Justice Department filed charged of sactions fraud and IP theft against Huawei, which should make for some interesting discussion when American and Chinese negotiators meet to discuss the trade war this week. 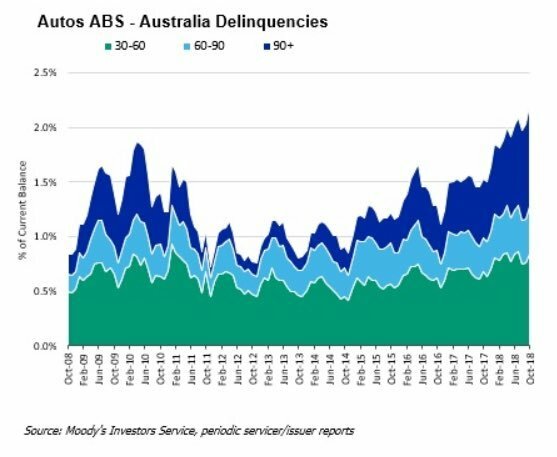 The value of auto-loans in arrears has surpassed the high mark seen during the GFC, with more than 2% of loans now overdue. Credit Corp (CCP) kicks off earnings season this morning with its half-yearly results. A weak result in its core business was offset by strong results from its lending and US debt buying businesses. Upgraded guidance also included. Eclipx Group (ECX) providid updated guidance and an update on the proposed merger with MMS. RBA rate decision on Thursday - the ASX's RBA Rate Indicator is indcating 0% chance of a rate change.